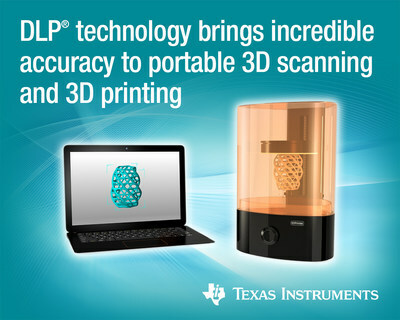 DALLAS, July 10, 2018 /PRNewswire/ -- Texas Instruments (TI) (NASDAQ: TXN) today announced new DLP® Pico™ controllers that deliver advanced light control capabilities in smaller form factors for mass-market 3D scanners and 3D printers. DLPC347x controllers offer the micron-to-sub-millimeter resolution typically found in high-performance, industrial-grade applications in a smaller form factor for desktop 3D printers and portable 3D scanners. For more information about DLPC347x controllers, see www.ti.com/DLPC347x-pr. Read our High accuracy 3D scanning using Texas Instruments DLP® technology for structured light white paper on enhancing 3D scanning applications with DLP technology. Download the DLPC3470, DLPC3478 and DLPC3479 datasheets to learn about DLPC347x controllers. Learn more about the optical module manufacturers we work with and get started developing your product. Since 1996, award-winning TI DLP technology has powered the world’s top display devices to deliver high-resolution images rich with color, contrast, clarity and brightness for a wide range of applications, including industrial, automotive, medical and consumer market segments. DLP technology is being used in movie theatres (DLP Cinema® products) and large-scale, professional venues and conference rooms, classrooms and home theaters. With mobile devices enabled by DLP Pico technology, users have the ability to display images from the palm of their hand. Every DLP chipset features an array of microscopic mirrors that switch on and off up to 10,000 times per second. To learn more, please visit www.ti.com/dlp. DLP is a registered trademark and Pico is a trademark of Texas Instruments. All registered trademarks and other trademarks belong to their respective owners.